1. Preheat oven to 400F. Measure out 2 cups (approx. 8 oz) of mozzarella cheese and put into a microwave safe bowl. 2. Microwave the cheese until fully melted and pliable (approx. 90 seconds). Add 3 tbsp. cream cheese and 1 egg to the cheese and mix it in well. 3. Add 3/4 cup almond flour, 1 tbsp. psyllium husk powder, 1 tbsp. Italian seasoning, 1/2 tsp. salt and pepper to the cheese mixture and mix together. 4. As you mix the dough, it should become cool enough to work with your hands. Knead the dough together until you can form a round ball. 5. Plop the ball onto a silpat with 1 tsp. olive oil to keep it easy to work with. Press the dough out with your hands, forming a circular pattern as you press outward. 6. 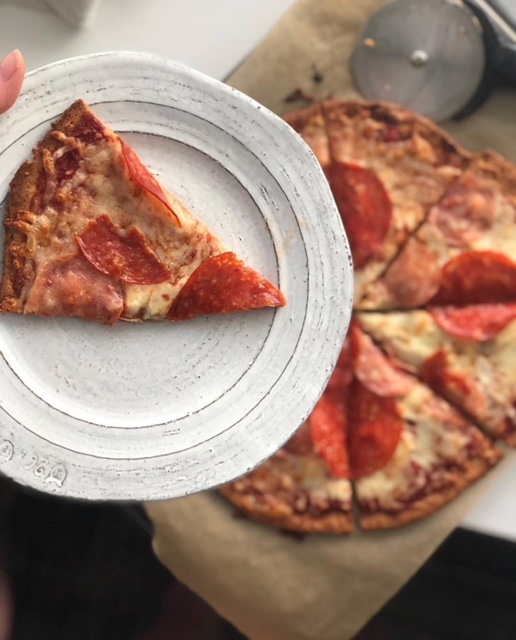 Bake the pizza for 10 minutes on one side on an upside down cookie sheet and remove from the oven. 7. Flip the pizza to the other side and bake for another 2-4 minutes. 8. Remove the pizza from the oven and top with toppings of your choice. 9. Bake again for an additional 3-5 minutes, or until cheese is nicely melted. 10. Let cool slightly, cut into slices, and serve. Optionally, sprinkle oregano over the top!